Dear Curt, Just a note to thank you for a wonderful car-buying experience. I recently purchased a classic 1952 Ford F-100 from Duffy’s Classic Cars in Cedar Rapids Iowa. They were honest, straight forward, and negotiated a fair price with me. Craig was very quick to respond to all my emails and worked hard to make the process easy. They took care of all the paper work and have a great reputation here in Iowa. Everyone knows of them and their high standards. After taking possession of the truck the new air conditioner compressor failed. Craig sent someone to pick up the truck and they quickly ordered and installed a new compressor and returned the truck to me in a few days. All at no charge to me! What great service! They really stand behind their reputation. I am so happy I purchased my beautiful truck from them! Thank you Craig and all the guys who helped me! I just wanted to drop you a line or two regarding my recent purchase of my 1969 Chevelle. My initial call was answered by Curt, a real gentleman, and after me explaining my needs he transferred me to what he called his "Ace". That was you Ronnie and was he correct, after only five minutes on the phone I felt comfortable and trusting of what you what you were telling me. To me, the car buying process must feel right, and if it doesn't, you'll know soon into the transaction. Your knowledge and experience really paid off for me, my family and I love the car and would recommend your organization, and you, to our friends and family. I have recently joined a local club and two of the members knew of you and had purchased cars from you in the past. Jon did an excellent job putting the final touches on the car and too was easy to talk to. With your pricing being in line and in many cases better than the other collector car dealerships, I can say, I will be back. Thank you again. 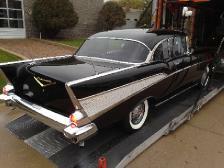 Honest people of their word are how I would describe Duffys Classic Cars (formelry Classic Enterprises). On Jan 16, 2018 I purchased a 58 Impala sight unseen from Duffy's. After the purchase I hired them to install power windows and cruise control before I came to pick up the car. Two days before I was set to leave and drive the car home to Oklahoma, I received a call from Craig, the salesman. The General Manger, Ron, was test driving the car and thought something was wrong with the transmission. After getting with the Shop Foreman, Travis, they discovered metal shaving in the transmission pan. Craig informed me they had already found a newly rebuilt transmission that was even better than the one currently in the car from a very reputable shop, Fountain Transmission in Iowa City. I had signed a purchase agreement two weeks earlier that I was buying the car as is, no warranty. They didn’t have to do that. They already had been paid in full for the car. Because they sold me the car believing it had a good transmission, they went above and beyond to make it right. With only a two day delay, On Jan 31st I saw and drove the car for the first time. It was everything they said it was and more. They had completely gone through the car, fixed everything they found wrong and even added a few little extras for me. Craig took me to meet and talk with everyone about the car, including Chad the mechanic that did most of the work, John the buyer who found the car and told me all about the guy who built it along with Ron and Travis as well. When I test drove the car, the cruise wasn’t working at higher speeds. After a few adjustments it was working and I was on my way back home. On the way home I discovered the cruise wasn’t working like it should. To make a long story short I worked with Travis and Chad over the phone to make some adjustments but couldn’t get it to work. Classic Enterprises found a local Dakota Digital installer, told me to take it to them for the repair and they would pay for it. Everything is working good now. I have the car of my dreams thanks to the honesty and integrity of the fine folks at Duffy’s. I can’t say enough about these guys. When everything goes right anyone can look good. But when things go bad, in this case very bad, that’s when you see the true colors of a business. Thank you Duffy's Classic Cars! Had a great experience with the purchase of my 1970 Boss 302. Ronnie described the car exactly as it was and took care of all the details to make sure it was delivered as described. Jon in the shop also is extremely friendly and helpful and was able to provide important details on the car and previous owner. I would not hesitate doing business with them again! No surprises on this well represented Cadillac. In November we received an excellent original 1976 Eldorado convertible from CE (Duffys) in The Netherlands . It had the rare color commodore blue and was as nice as described on the website. The owner is very pleased with it. Hope to do business with CE (Duffys)again!